Today we drive to Lisbon. 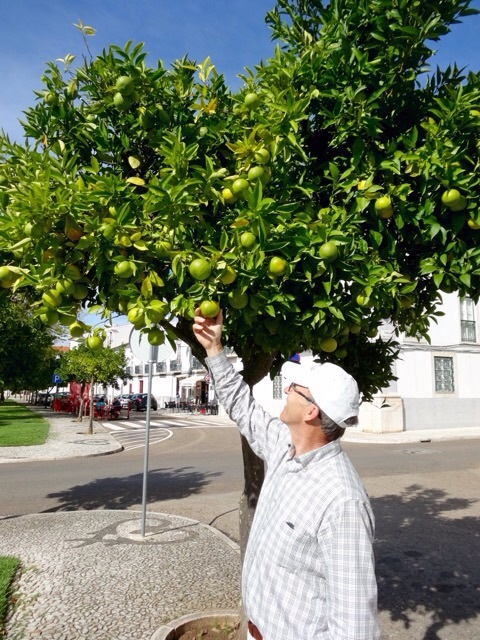 We leave Mérida and cross the border into Portugal near Elvas. We park our car on the edge of the town and walk into the old walled part of the town to find a place to buy Portuguese SIM cards for our phone and iPad. It isn’t that easy! The people at the Information office tell us that the Post Office sells them, so we go there and purchase two cards. We manage to get the first one working after calling the UZO company for help, but we are told it will take 12 hours or more to hook up our iPad internet! It appears that this isn’t the best SIM card for us, but it will get us to Lisbon until we can get a better one there. Back on the road and I notice a town high on a hill as I am taking pictures out the car window. I do this to help pass the time on the drive, and sometimes I actually get a decent picture or two. 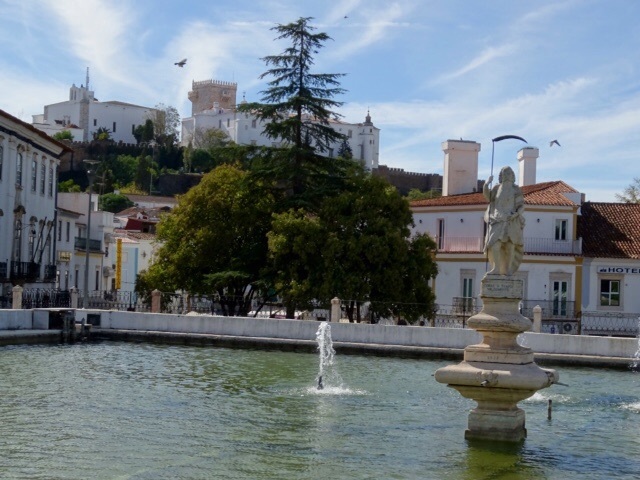 I remember my Mom telling me about a town with white houses high on a hill so I check the map and this town is Estremoz. 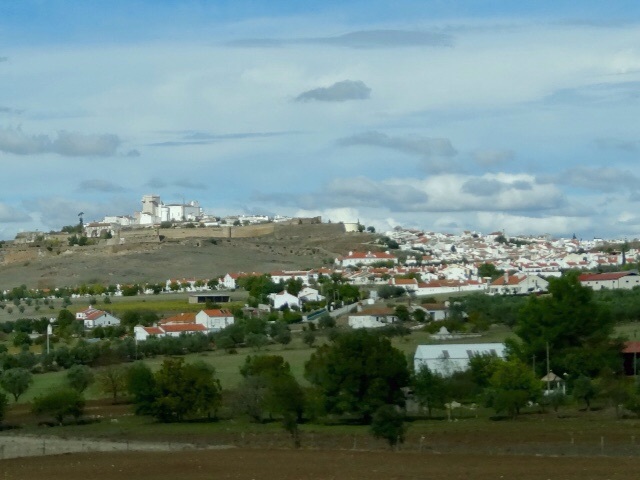 I am pretty sure this is the town my Mom and Dad visited when they were in Portugal years ago, so we take a detour and head for Estremoz. After having lunch, we walk around and check out a few of the shops and Bob buys himself a souvenir, a big wooden spoon for making his salsa and spaghetti sauce. Orange trees are used for boulevard trees here and some of the other ciities we have been in but so far we haven’t found any that are good to eat. 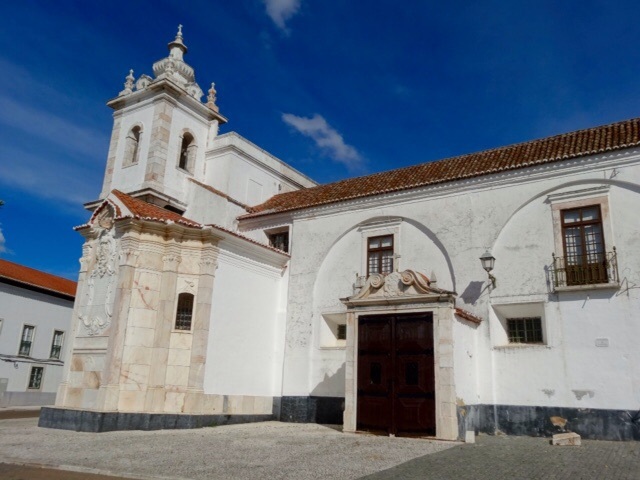 This is one of the many interesting old buildings near the central plaza of Estremoz. 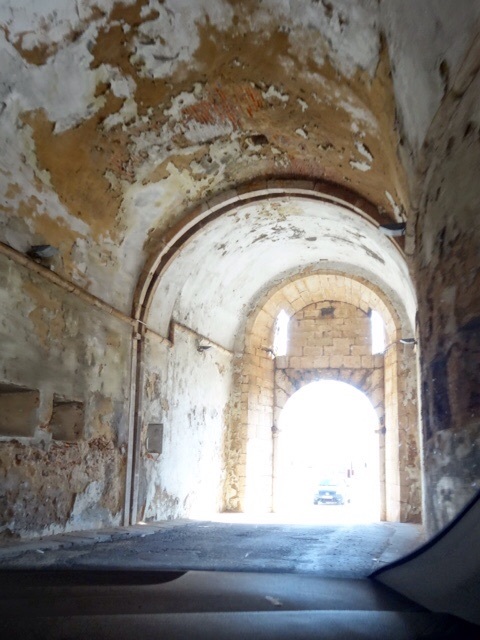 We leave Estremoz by driving on a narrow one way road under some old buildings, and this is the way to the main road! Once again I think how happy I am to have the iPad GPS. No way I could find my way around without it. 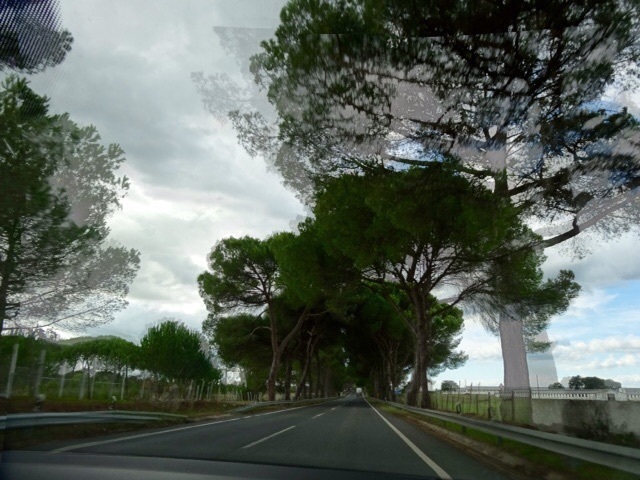 We pass lots of cork trees but there is no place to stop so I don’t get any pictures, but I take this photo of some coniferous trees lining the road and get a weird effect happening. No idea what caused it but I kind of like it. The houses we are passing have changed, they are now painted white or pastel colours instead of the brick or stone we have seen up till now. 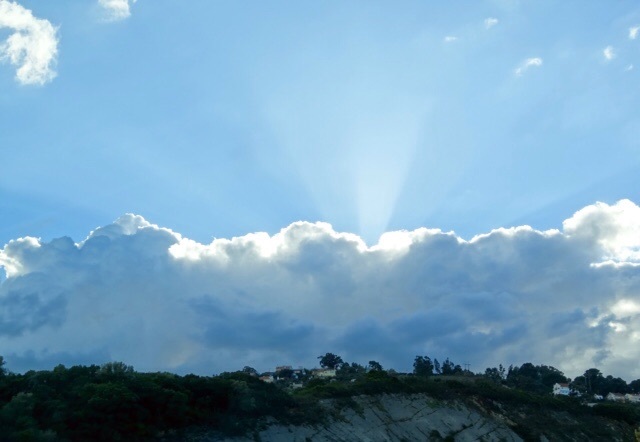 The clouds start to build and soon it is raining. 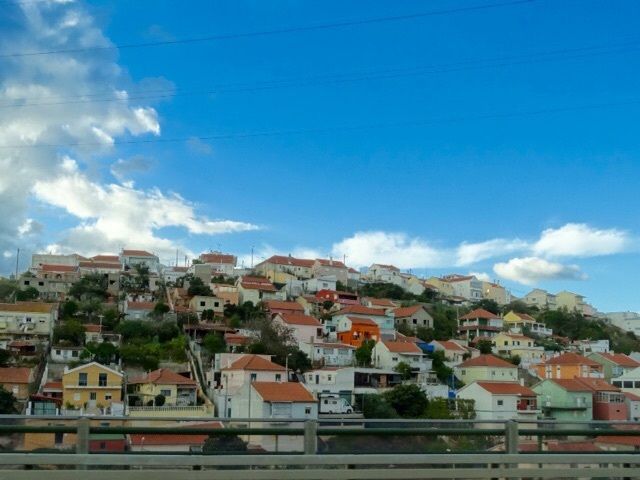 We arrive in Caxias, which is a town just outside of Lisbon and check into our apartment for the next week. 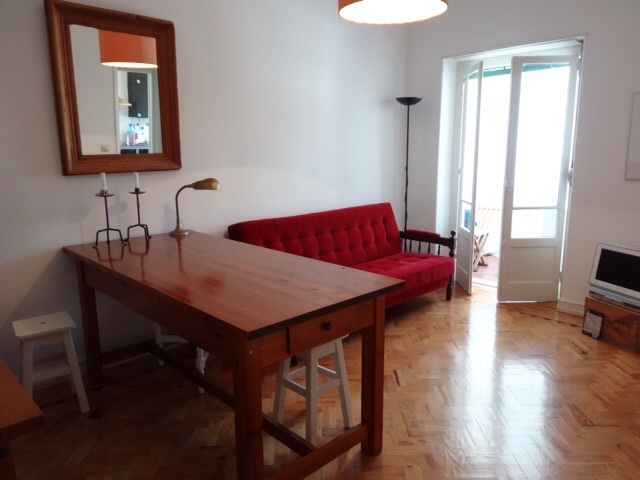 We have been very lucky with our Airbnb bookings and this apartment seems just as nice as our other bookings. It was less than a five hour drive but it seems like it has been a long day and it was nice to walk into such a nice place. 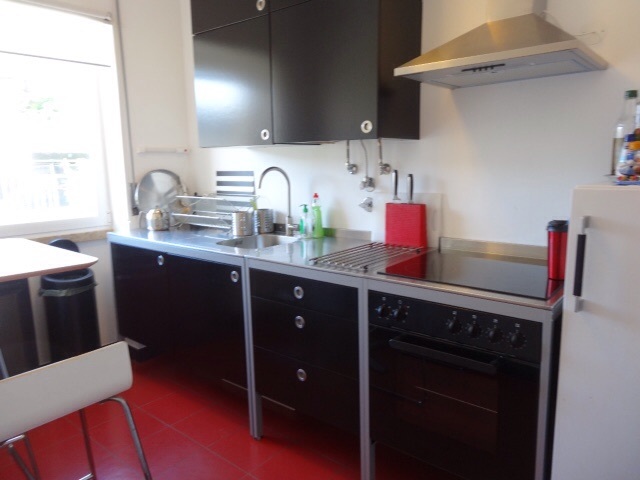 This entry was posted in Airbnb, Estremoz, Historic Buildings, Portugal, Spain and tagged Airbnb, Portugal, Portuguese Towns, Spain, Spanish Towns by Trudy. Bookmark the permalink. Nice accommodations! Loved the photo of the “weird” trees.